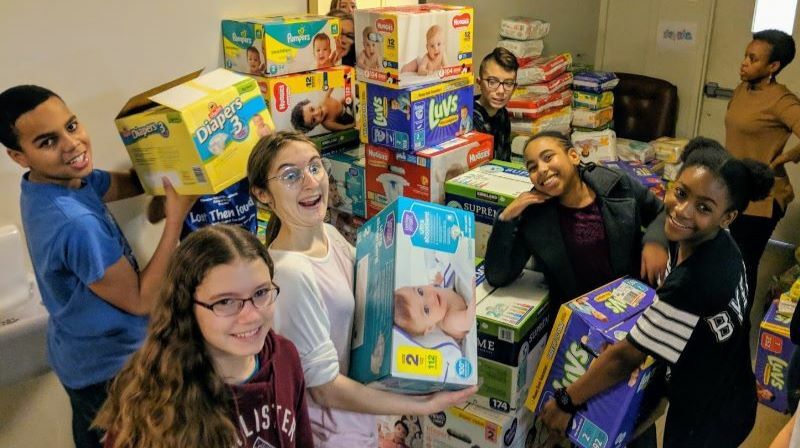 On February 24, youth and youth leaders from Princeton UMC and First UMC of Delran gathered at Turning Point UMC to pack diaper bags for families and organize the 90,000+ diapers that were collected from churches all across GNJ for the purpose of blessing families. Michael Reed and Susan Victor were on hand to help lead the charge. Pastor Rupert Hall of Turning Point UMC spoke to the group which was comprised of middle schoolers, high schoolers, and confirmands, about the importance of connectionalism and working together. “One of the goals of The Maker’s Place is to encourage and make space for groups to work together,” said Reed. The Diaper Bag Packing initiative was a part of a much larger project to help supply diapers to families in need in Trenton. “At times like this, when our denomination is engaged in difficult conversation, I think it’s all the more important for the church to be the church. I believe we did that today,” said Reed.